So on Wednesday, I was stupid. On Tuesday evening I had glued the Carbon Fibre on, ready for shaping on the Wednesday morning. Carbon Fibre is tough stuff so I wanted to remove as much excess off the handle with a saw before going to the belt grinder. I put the knife in a vice, blade down and sawed some excess off. At the same time, I was thinking about other things, daydreaming. Big mistake! I half thought - oh, I could do with taking a bit more off. I repositioned the knife in the vice the other way up so it would be easier to get the rest off. The blade was now facing up, uncovered. I was still daydreaming, not really thinking about what I was doing. The saw was quite blunt, so needed quite a bit of force. Just as I was about to finish the cut, I realised what I was doing. This was really stupid! My left hand was over the knife blade. At the same time as completing the cut, I started to pull away but the hacksaw pushed my hand down on to the upturned blade. It actually didn't hurt too much - a good sharp blade!! So anyway, I was looking at my hand - an inch and a half gash across my palm with a big hole at the start and exposed tendons. I was not impressed! What a complete and utter stupid idiot! I have damaged some tendons previously (not in a knife related accident) that required surgery and I had visions of going through that again, with all the recovery time as well. I thought this would be worse because after all, I had just stuck a knife in my hand. To add to my stupidity, I was so angry with myself that I kicked a very solid door full on. That hurt too! The good news is that when I went to a A & E, all I needed was three stitches in my hand with no tendon damage. I can only conclude that because I realised what was about to happen and started to pull away, it stopped the damage being too severe. It doesn't look as severe stitched together as when it was open. My grip is fine (although I'm not using that hand) but I do have a loss of feeling in parts of the last three fingers. Very, very lucky. 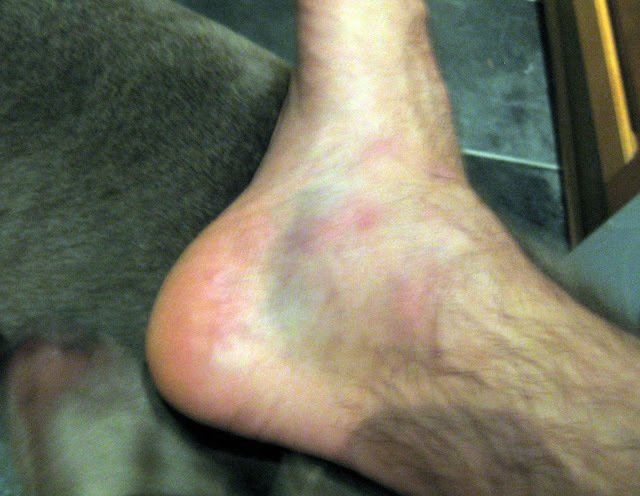 My foot ballooned and was bruised both sides of my ankle. I've been struggling to walk for the first two days but while it still hurts, I'm not limping. Ironically it's actually more of an annoyance than my hand.